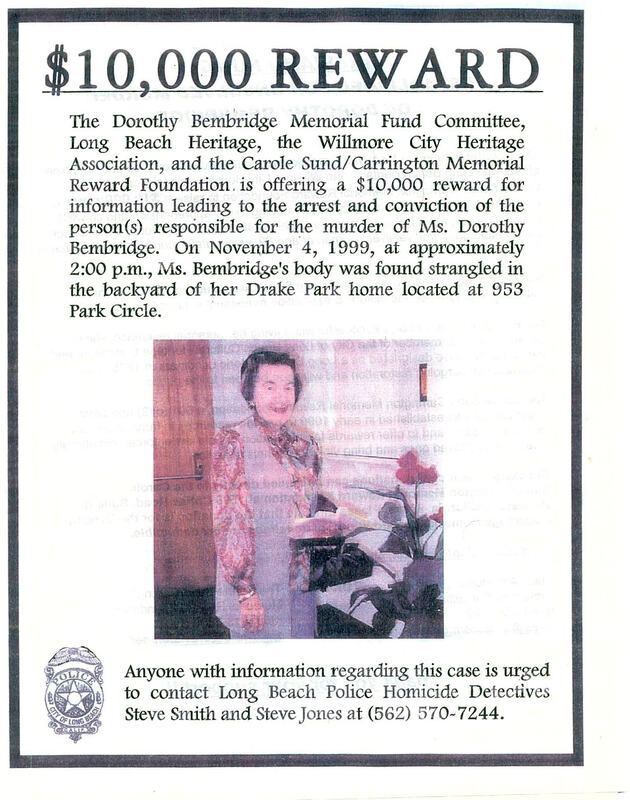 (March 3, 2001) -- Fliers were distributed March 1 in the Drake Park area offering a $10,000 reward in connection with the murder of 89-year old Dorothy Bembridge, found strangled in the backyard of her Drake Park home in November, 1999. Text on one side of the flier (reproduced above) says "The Dorothy Bembridge Memorial Fund Committee, Long Beach Heritage, the Willmore City Heritage Association, and the Carole Sund/Carrington Memorial Reward Foundation is [sic] offering a $10,000 reward for information leading to the arrest and conviction of the person(s) responsible" for Ms. Bembridge's murder. The reverse side of the flier discusses efforts to raise the $10,000 reward fund (discussed below). We have posted both sides of the flier in .pdf form on a link, below. Ms. Bembridge was part of LB's historic preservation movement, saving her personal residence and having the house designated a Long Beach Historic Landmark in 1978. The house is reportedly undergoing restoration and will soon be open to the public. One of the contacts listed on the flier is Ms. Kristy Aridizzone of Ardizzone Consulting, pictured center at the March 1 event, between two LBPD officers. Ms. Ardizzone alerted LBReport.com to the event. "The Carole/Sund Carrington Foundation is guaranteeing the $10,000 reward while the funds are being raised. This ensures the integrity of the fund, as well as enables prompt payment of any rewards that might need to be made. The donations to date are sent directly to the Carole / Sund Foundation payable to: Bembridge Memorial Fund - TAX ID # 33-0201588 See flyer for address information."